CARY, N.C. – Davenport made its National Championship double intentions known Saturday with a clean sweep of its three-team pool in the Women’s Division II competition at the 2016 USA Rugby College 7s National Championships at WakeMed Soccer Park. The nine DII teams did not compete Friday, with the smaller field of teams playing just two matches of pool play prior to the knockout stages. The Cup and Plate Semifinals will follow the respective Women’s DI knockouts Sunday in a consolidated schedule due to the impending Tropical Storm Bonnie. All matches on the final day of College 7s will be broadcast on The Rugby Channel. The Panthers are coming off of a DII National Championship in the 15s game won earlier this month, but Head Coach Greg Teliczan saw early signs of holding the ball a little too tight Saturday in defeats of Springfield and Utah State. “There’s a big difference switching from 15s to sevens,” he said following Davenport’s final win of the day. “Also, just to get more acclimated to how our sevens style is. Even though we played it last year, we need games to play to get into a system, a rhythm. Davenport did end up with the top seed, and will play an Ithaca team in the Cup Quarterfinals that kept second-ranked Bloomsburg to a 12-10 victory in its first match of pool play. Rutgers benefitted from Montana State’s loss to Texas State to win Pool C, giving the Scarlet Knights a matchup with the Huskies. The elite crop of Men’s DII teams has shown itself time and time again on the National Championship stage, and the 2016 College 7s has not seen a change of pace. Minnesota-Duluth, Champion of the 15s game, has played Wisconsin-Whitewater a few too many times at this level, though. The past two Men’s DII 15s title deciders have been between the Fighting Penguins and Warhawks, and last year’s College 7s DII Cup Semifinals had Whitewater advance to the Final at the expense of Duluth, though it was in vain. The Warhawks conceded just 12 points in two pool matches Saturday, and dealt with 2013 DII College 7s Champion Principia as No. 1 in the Cup Quarterfinals. Duluth was up next in the stadium, and battled a focused UT San Antonio team for a 15-5 victory. “We didn’t know Niagara or Tulane – we’d never seen them before,” Duluth captain Trace Bolstadt said of his first two pool opponents. “So we just tried to do our best against them and play Duluth rugby. "Business partners on the field, legends off"
First-year Lindenwood-Belleville put on a display of skill in its 31-5 defeat of Salve Regina in the Cup Quarterfinals, utilizing space on the pitch as well as in the air to cross the try line five times. The Lynx may have to pull some more tricks out of their sleeves Sunday in the Semifinal against Duluth. 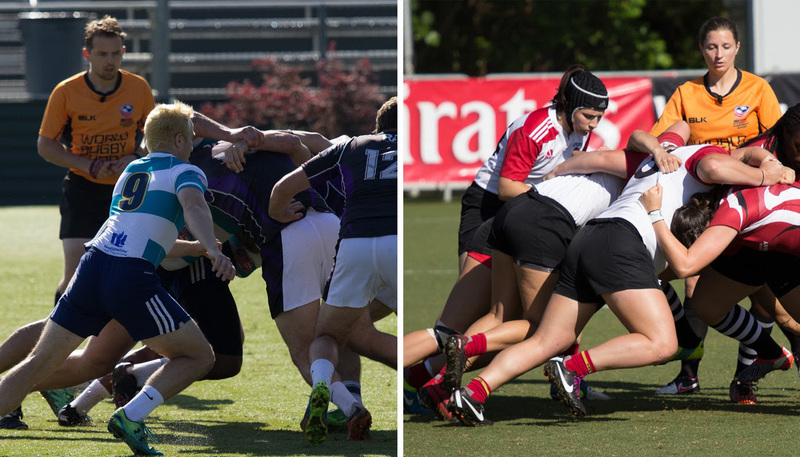 More information on schedule changes can be found on USACollege7s.com, while all of Sunday’s action can be watched free of charge on The Rugby Channel.